This set is ideal where wall-mounted technology is most convenient. The TSS Wall Station’s adjustability and strength make it ideal for shared work spaces including healthcare offices, laboratories, and manufacturing settings. 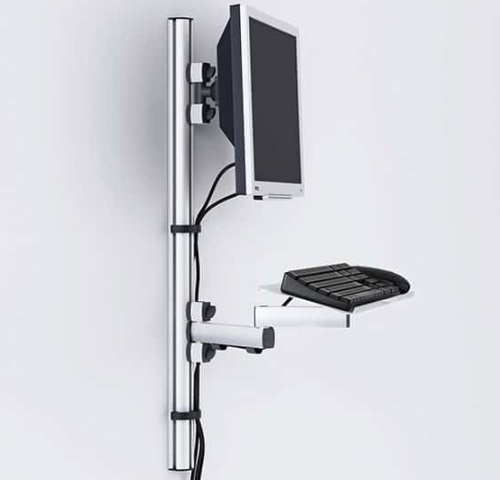 Includes a 35″ wall mount TSS column that allows the monitor and keyboard arms to be adjusted for the perfect height, whether standing or sitting. Also included is the TSS Support Carriage for 1 monitor weighing up to 33 lbs with a range of 4.13″. The TSS keyboard holder holds a standard keyboard and mouse, extending to 20.79″ and tilting to a 45 degree angle. TSS Wall Station is covered by a 5 year manufacturers' guarantee.